The global economy is facing a 'sink or swim' situation now that central banks have done all they can to pump liquidity into the markets. Let's be blunt: The central banks have done all they can, and now it's 'sink or swim' time for the global economy. This week the European Central Bank unveiled a massive stimulus program -- worth $1.3 trillion -- to lift the region out of its economic malaise. It was the latest in a long line of stimulus measures from central banks around the world. But it will only work if everybody else follows through. European politicians and policy makers must now make decisive moves to increase productivity, investment and growth, which can involve reforming labor market rules, promoting entrepreneurship and tweaking tax codes. "We all have a job to do," said ECB member Benoit Coeure during a panel discussion on Saturday at the World Economic Forum in Davos. "We have done our part. Others have to do their part." The stimulus certainly buys more time for European governments to press ahead with economic reforms. But they had better move quickly! 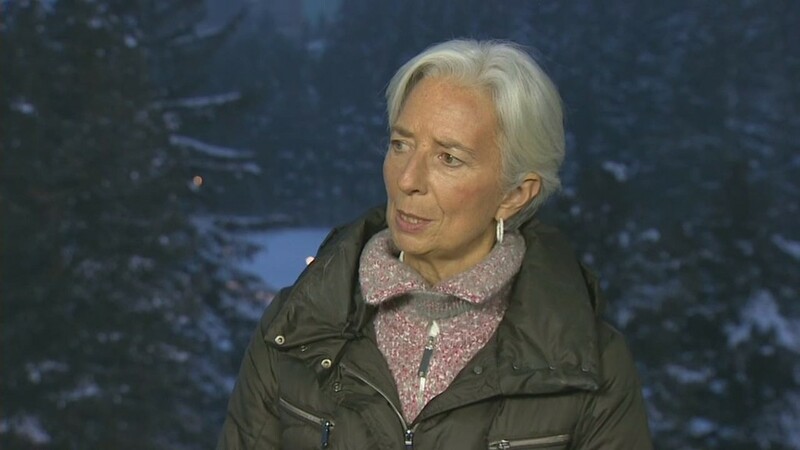 The head of the International Monetary Fund, Christine Lagarde, told CNN this week that "inaction" is currently the biggest global risk. But as the ECB money starts sloshing around the financial system and flowing into other parts of the world, concerns have been raised about reckless risk taking and financial instability. Mark Carney, governor of the Bank of England, warned that markets shouldn't assume central banks will always come to the rescue when asset prices fall. Carney also said he was expecting more market volatility and cash crunches to emerge in different markets as diverging central bank policies in Europe, Japan and the U.S. lead to unexpected shifts in the flow of money. In short, central banks are watching out for these risks, but investors had better be careful too. 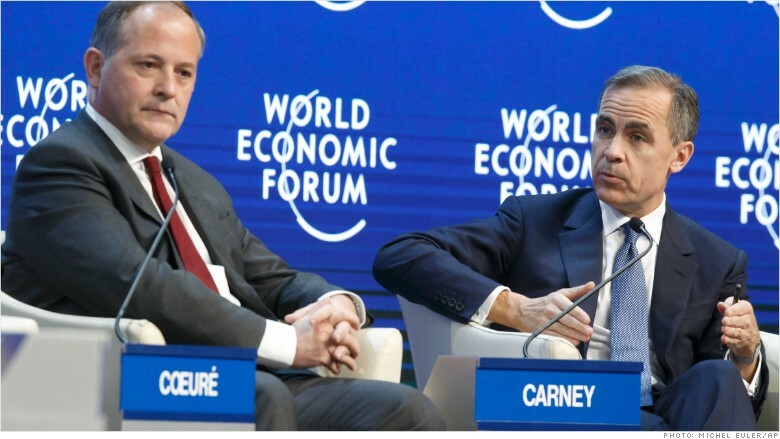 ECB member Benoit Coeure (left) with Bank of England governor Mark Carney at the World Economic Forum. There's also the distinct possibility that the new ECB program will fuel further wealth inequality, which could lead to growing social division. Both Carney and Coeure recognized that central bank stimulus measures tend to benefit people who already have investments and assets, while hurting everyday savers. "Monetary policy always has distributional consequences," said Carney. Billionaire investor George Soros also warned about the issue this week. "My main concern is that [the ECB stimulus] will make the divergence between the rich and poor bigger," he said, during a separate Davos event. But growing inequality isn't a sure thing. "You can have the best of both worlds" if countries implement programs to support the unemployed and improve the labor market, said Coeure. But then again, these financial heavyweights don't have crystal balls to see the future. In fact, as they try to predict what to expect in 2015, they are humbled by the fact that they did not predict falling oil prices, a crisis in Ukraine, a fall-out with Russia and a rise in the extremist group ISIS in 2014. "I hope we're going to be a little better [with our predictions] this time," said Laurence Fink, CEO of BlackRock (BLK), who moderated the Davos panel on Saturday. When it comes to expecting the unexpected, the panelists agree that technology has the power to reshape global dynamics. For example, fracking technology created a glut of oil supplies and drove crude prices below $50 per barrel, causing a range of knock on effects around the world that no one could have predicted. "Technology ... is under appreciated, at least by politicians, as to how [it's] transforming their societies," said Fink.